“It’s all messy. The hair. The bed. The words. The heart. Life.” A poet named William Leal once said that. Not sure when he wrote these words, or who he is exactly, but he made a very valid point. Nothing ever really goes as planned, does it? 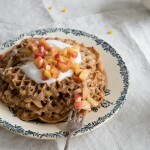 These vegan apple cinnamon waffles turned out a bit messy as well. I planned for perfect heart shaped mini waffles. But no, little bits of the waffle stuck to iron, as I forgot to grease it the second time. The edges are also a bit crumply and uneven, because I didn’t use enough batter to make it spread evenly. I also forgot to put the sugar in before adding the wet ingredients, but I don’t think that really made a difference. I like them better this way, though. Next time, I won’t forget to grease the iron (maybe). Or I’ll just cover them in (coconut) yoghurt and sautéed apple and no one will even notice what they look like. And the best thing about these waffles? They taste insanely good. Of course. 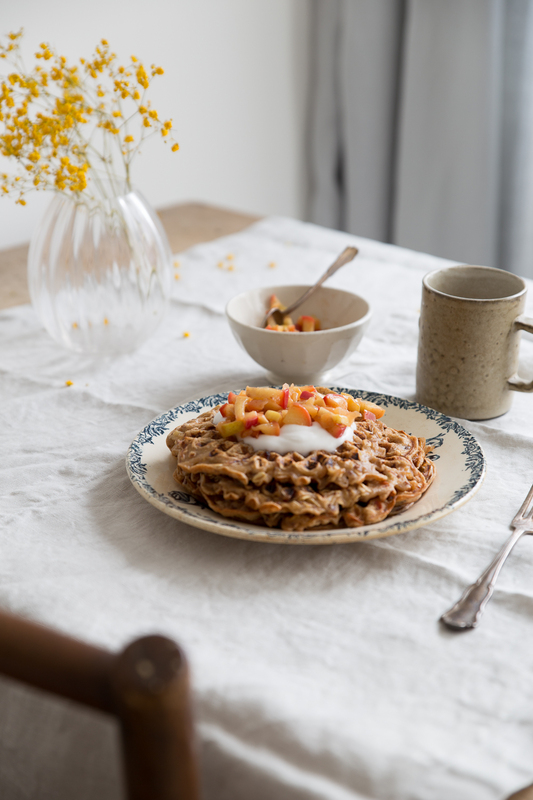 Perfect for a slow Sunday breakfast. A Sunday morning when there is no need to rush and there is room to mess things up. Scroll down for the delicious recipe (adapted from Minimalist Baker). 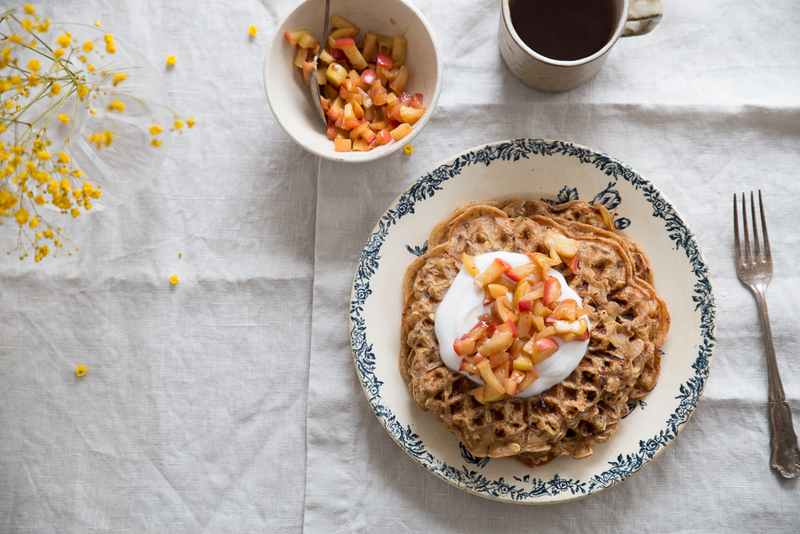 They’ll be the best messy Sunday breakfast waffles you’ll have. 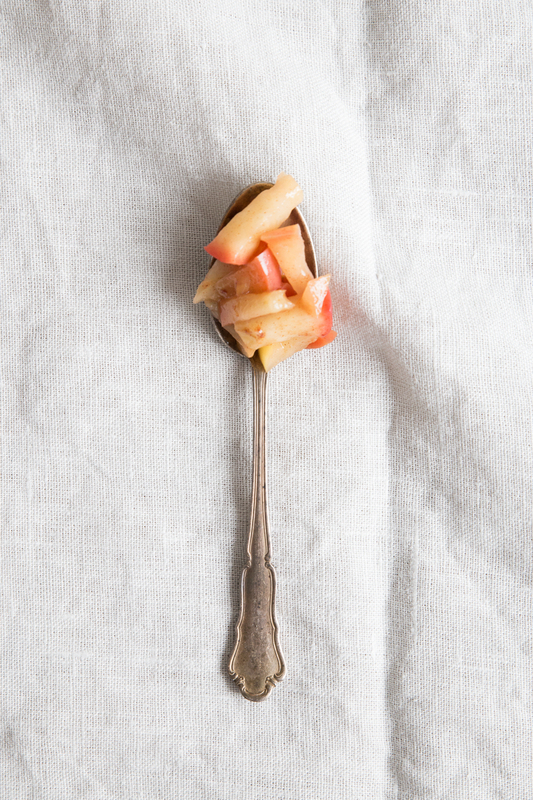 Start by sautéing your apples. Heat a large skillet over medium heat. Once hot, add butter, then apples and stir. After a few minutes add in the brown sugar and cinnamon. Cover to let it steam and soften, stir frequently. Once softened (about 4-5 minutes) remove lid to let it caramelize a bit more. Remove from heat. Next, prepare your waffles. Start by preparing flax egg by combining water and flaxseed in a large bowl and let it rest for 5 minutes. Add maple syrup, applesauce, melted butter or oil, brown sugar and whisk it all together. Add the almond milk and stir once more. Add flour, baking powder, salt and cinnamon to a sifter and sift over the wet ingredients. Stir until roughly combined. Gently fold in oats, then half of the apples. If batter appears too thick, add a little bit of almond milk. Let batter rest for 5 minutes before preheating waffle iron. Once preheated, grease your waffle iron with coconut oil and spoon about 1/2 cup of the batter onto the center of the iron. Press down to spread the batter and cook according to your machine’s instructions. Once done, remove and place on cooling rack to let steam roll of and crisp up a bit. 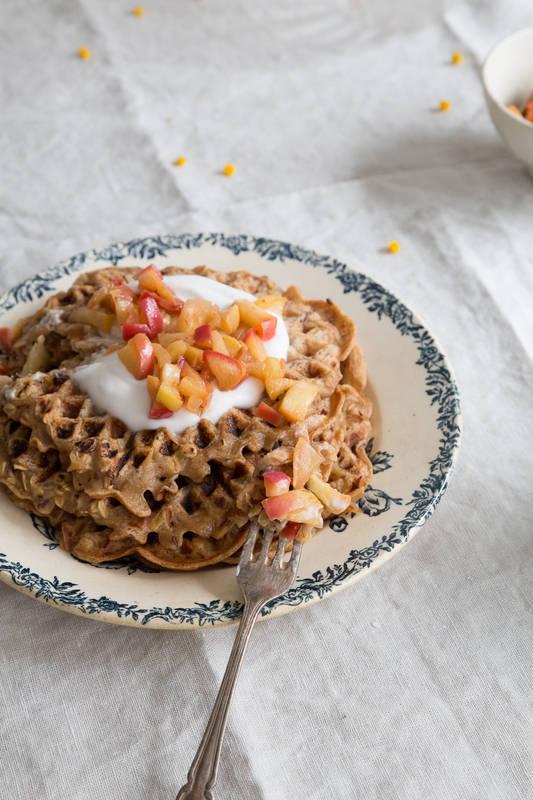 Serve warm with coconut yoghurt, and the leftover apples. Store in an airtight container in the freezer and warm in the toaster or oven.